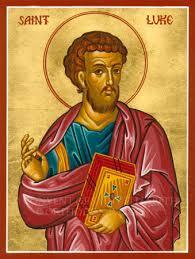 Summary: St Luke, Evangelist, Missionary. By early Christian tradition, Luke is named as author of the Third Gospel and the Acts of the Apostles. Almost certainly a Gentile and perhaps a companion of Saint Paul (29 June), he wrote to reassure those who had grown uncertain toward the end of the first century. In his gospel, the compassion of Christ is inclusive of all:Gentile and Jew, the poor and the rich, women and men, the outcast and the privileged. St Luke is the author of the third gospel and of the Acts of the Apostles. He is also the patron of medical doctors, and of artists and painters. In art, Luke is represented by a winged ox. This may indicate that the Gospel of St. Luke hints at the priestly and sacrificial work of Jesus. The ox may symbolise the sacrificial aspect of Jesus’ ministry with the wings suggesting that the Gospel of Jesus Christ is to travel throughout the world. Patrick Duffy introduces him. According to the historian Eusebius (Church History III.4.6) Luke was a Greek-speaking physician who lived at Antioch in Syria. The composition of the third Gospel and of Acts and the range of their vocabulary indicate that Luke was an educated man. Professor E.M. Blaiklock compares Luke’s work with that of the classical historian Thucydides (460-395 BC) “for accuracy of detail and for evocation of atmosphere”. The Acts of the Apostles, he says, is not a shoddy product of pious imagining, but a trustworthy record, that is confirmed by archaeology. Paul’s First Missionary Journey in the book of ‘Acts’ was written by Luke. He travelled with Paul on some of Paul’s missionary journeys. 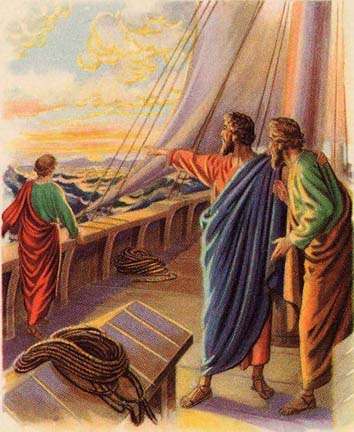 Paul makes several mentions of Luke in his letters (Philemon 24 – “Epaphras, a prisoner with me in Christ Jesus, sends his greetings; so do my colleagues Mark, Aristarchus, Demas and Luke”), Colossians 4:14 – “Greetings from my dear friend Luke, the doctor, and from Demas”) and 2 Timothy 4:11 – “Only Luke is with me”). The “we” passages in Acts show he travelled with Paul as a companion on at least some of his missionary journeys: crossing from Troas in Asia Minor over to Philippi (16:11-16); Troas to Miletus and on to Jerusalem via Cos, Rhodes, Patara, Ptolemais and Caesarea (20:6-21:18) and finally on the journey through the shipwreck on Malta and on to Rome. (27-27). The distinction Paul makes in Colossians 4:10-11 and 14 between his colleagues “of the circumcision” and his other co-workers including Luke and Demas indicate that he may have been a Gentile or at least that if he was a Jew he did not strictly adhere to the rituals of Judaism. In the Gospel according to Luke the parts proper to him include the account of the birth and hidden life of John the Baptist and Jesus: this includes the annunciation, the visitation, the presentation and the hidden life (Luke 1-2). All this is an introduction to the transcendent nature of the person of Jesus. Two other outstanding characteristics of the theology of Luke are: firstly, his emphasis on the compassion of Jesus as articulated especially in the parables of Lk 15 – the lost sheep, the lost coin and the prodigal son; and secondly, his emphasis on the role of women. In the Acts of the Apostles he stresses the movement away from Jerusalem into the Gentile world and finally on to Rome, hinting at the universality of Christianity. There is a Christian tradition, especially strong in Eastern Orthodoxy, that Luke was the first iconographer, and that he painted pictures of Jesus and Mary. Guilds of St Luke were formed in the cities of Flanders and at Rome to protect and promote painters.